Apprising Ministries has been among the online apologetics and discernment ministries keeping you up to speed on Warrengate. This all began when Dr. John Piper made the dubious decision to make Purpose Driven Pope Rick Warren the keynote speaker at the recently concluded DG 2010 conference Think: The Life of the Mind & the Love of God. My friend and AM correspondent, Daniel Neades of Better Than Sacrifice, has written Enough! Scripture twisting is not ‘doctrinal and sound’ concerning the message of Rick Warren at DG 2010; and today we were discussing the comments which I highlighted above. 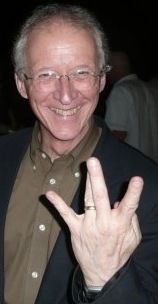 I told him I’d been reading again what Dr. Piper has said about Warren, as well as the alleged “slander” of Rick Warren. 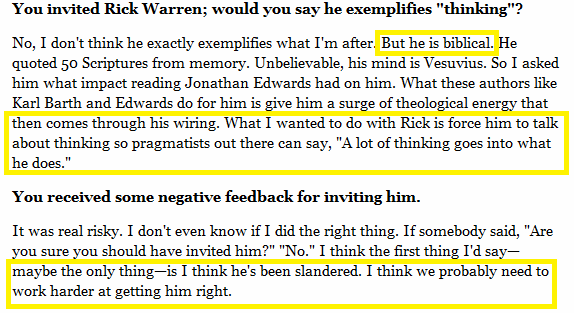 The major problem here is that Rick Warren refuses to engage his critics or defend his ideas. Unless he is willing to argue for, say, his handling of Scripture, there can be no development of the critics’ understanding of his position. This is not the fault of the critics, who have shown themselves to be very willing to engage; but rather of Warren, who refuses to enter into the conversation. Thus, the plea to ‘work harder at getting him right’ is misdirected if it is aimed at Warren’s critics. Rather, it must be aimed at Rick Warren himself. If he is misunderstood, let him answer his critics and show that he is actually exegeting Scripture in a faithful way consistent with the historic orthodox Christian faith.